Below please find some information regarding your seat that you should be aware prior to travel. 1. Make sure that your passport is valid. 2. Comply with all migratory regulations of the countries of origin, destination and transit (in the event of connections). 3. Check the following link: IATA Travel Centre, to learn about the different requirements in countries regarding visas, sanitation, documents and others. Please note that this information is a guide of the migratory requirements for your trip. 4. Remember that it is your responsibility to know and be informed about all documents and requirements for your trip. 5. 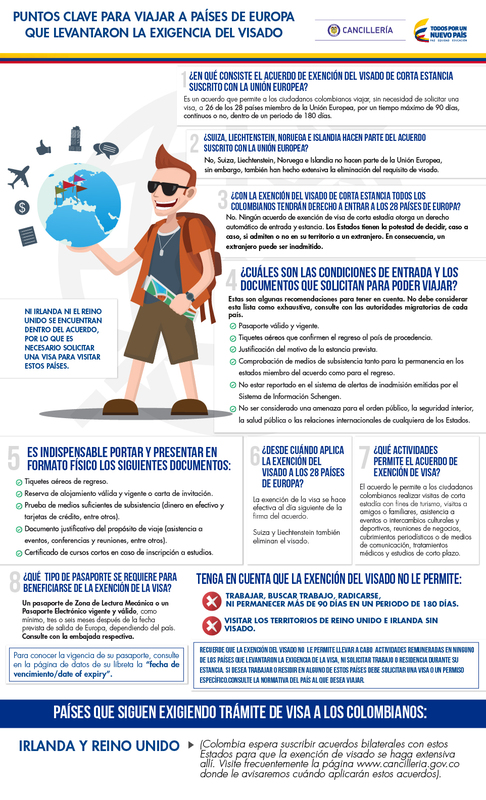 Know if you need a vaccination certificate to enter the country where you are traveling. You can find out on the World Health Organization’s website (available only in English). 6. Verify the modifications to the norms and obtain all documents to enter and exit a country, as well as the formalities required by the authorities, even before purchasing the ticket. 7. Learn about the migratory requirements at consulates or embassies of the country of destination or transit. Next, we offer relevant information about some issues which you should consider before travelling. Which European countries can I enter? You will be able to enter 30 European countries without having to request a Short Stay Visa. Check which countries are included. How does the exemption agreement work? The exemption allows you to remain in the country during a period no longer than 90 days. If you are staying longer, you must file a visa application. This means that migration control agencies could check your passport to see if, 180 days before you trip, you have a longer stay than 90 days. 180 days amount to a period of between 5 and 6 months. Check all scopes of the exemption. You may start travelling at will as from December 3, 2015, as long as you have an electronic passport with at least there months of validity. Starting on December 3, 2015, Colombian citizens can enter into 30 European countries without having to request a Short Stay Visa. Read more on the Agreement. The exemption applies only for tourists? For the benefit to be applied, the agreement allows no longer than 90 days as the period of time for business travelers, business travelers, students taking short courses, journalists carry out journalistic work, or artists doing exhibitions. Could the countries part of the agreement deny my entry? Yes. The agreement considers that each country is autonomous to admit or not travelers that come from other places. Also, they can demand that people should not be in the immigration violators list or in the list of security or health threats for the EU. Learn about the restrictions and benefits of the agreement. What are the documents required for travel? At the moment of travelling you must have your valid passport, round-trip airline tickets (to prove your length of stay), valid hotel reservation or invitation letter, proof of means of subsistence during the trip, among others. Check the list of documents required. Can I travel to UK without a Schengen visa? EU members can choose autonomously to be or not part of the cooperation policies of the Schengen Area. UK and Ireland decided not to be part of the agreement. So if you’re planning to travel those countries you should check with official authorities for the documents required to enter. If you still hav​e further questions when travelling to the European Union, we invite you to check the Colombian Foreign Office statements or consult with the specific countries you wish to visit about the Schengen visa exemption for Colombians. If at the time of travel the Passenger is an adult, but their passport was issued with their Child ID card number, this information must be changed for the National ID card, to avoid problems with the migration authorities. Some countries allow Travel​ers to​ transit without a visa (TWOV) when due to their flight schedule they have to transit or stop in a country on the way to their destination country. All required travel documentation for both your transit and destination country. The ticket to your final desired destination or a return ticket back to the point of origin. Sufficient funds or a credit card in case you have to buy another ticket. Visa for your final destination or previously issued valid entry authorization. You must travel without checked baggage. You must have a connection and confirmed ticket on an international flight outside Mexico City. You must have the complete route of your trip on a single ticket. For flights connecting in Mexico City, a charge of USD 75 plus taxes applies. The passenger cannot volunteer to offer his or her seat if the flight is oversold. Does not apply for passengers with discount tickets and/or subject to availability. Does not apply for passengers who must spend the night in Mexico City. Does not apply for passengers who have checked baggage, no exceptions. Depending on your nationality, you must show your visa. If you are a citizen of Haiti and intend to enter Ecuador for tourism during a time period of no more than 90 days, you must obtain the approval and acceptance code in order to enter the country before buying your ticket. Register with the EcuadorVirtual Consulate​ system and complete the Single Tourist Validation form. You may previously read the touristregistration instructions​. Attach the requested documentation and wait for the validation by an officer of the Vice Minister’s Office of Human Mobilization of Ecuador. Within a week, ​you will receive an e-mail indicating if you were validated as a tourist. If accepted, you will receive an alphanumeric code in such e-mail, which you have to present to the airline in order to purchase the ticket, as well as to the immigration officer at your arrival to Ecuador. This code shall have a maturity of 10 days maximum as of the intended departure date. Are you traveling to Galapagos? Starting on november 1, 2018, all foreign travelers entering this country must show Ecuadorian authorities proof of mandatory medical insurance.